Normally, at my local Kroger, Justin’s Peanut Butter Cups are $1.59 per pack. I bought the pack shown above on sale for $1.25. I remember a time when you could buy a pack of Reese’s cups for fifty cents. Those days are long gone, but you can still get an eight-pack for $1.50, or 19 cents a cup–and I would do so on the regular, if Reese’s would step it up and get themselves on the Ethical Chocolate Companies list. The milk I drank with it–well, my recollection’s a bit fuzzier, but I think it cost a little over two bucks a gallon. 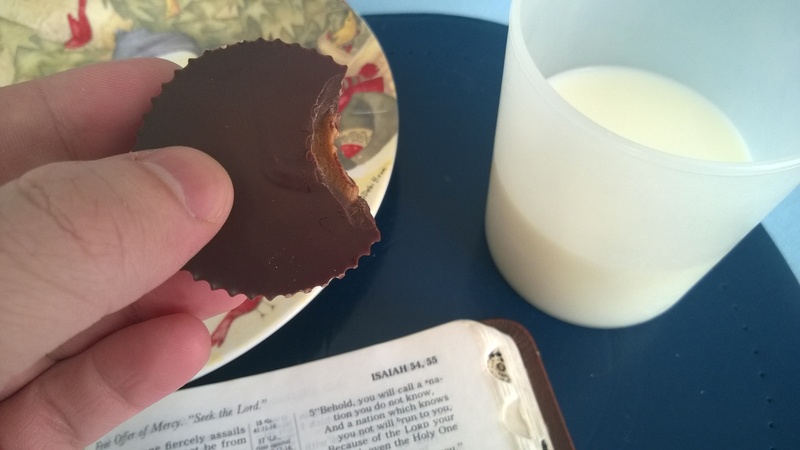 I, uh, pay more attention to peanut butter cups than I do to milk. Now imagine if God took over my local Kroger and started selling everything for zero dollars: you could all take bets on how many minutes before I got sick and had to lie down from a case of Chocozuma’s Revenge. That’s the scenario that Isaiah describes in the opening verses of chapter 55: “Come, buy wine and milk without money and without cost” (55:1). It’s an invitation to free food and drink! Now imagine if God took over my local Kroger, started selling everything for zero dollars, and I drove a block down to Big Mike’s Gas ‘n Go and paid full price for like five King Size Reese’s packs. Insane, right? But according to Isaiah, that’s what the people are doing: “Why do you spend money for what is not bread, and your wages for what does not satisfy? Listen carefully to Me, and eat what is good” (55:2). They can get any food for free at God’s Kroger, and they’re still paying full price for Reese’s cups. It’s free to pay attention to God, and he makes himself available to everyone. Isaiah goes on: “Seek the Lord while He may be found; call upon Him while He is near” (55:6). When may God be found? He’s eternal, so: always. And when is God near? He’s omnipresent, so: constantly. Put down the expensive junk food and eat God’s words for free. There’s some good stuff in vv.8-11 about the efficacy of God’s words, how they don’t return to him empty “without accomplishing what I desire” (55:11), unlike our own words which so rarely communicate what we intend to. But I gotta wrap this post up and do some last-minute Christmas prep. 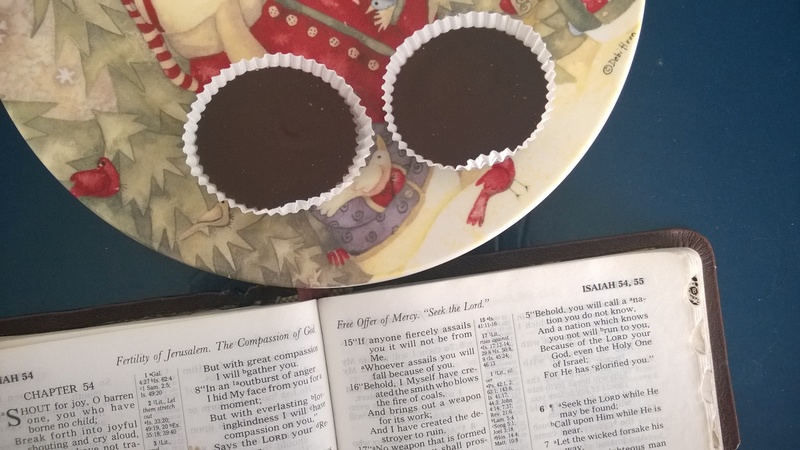 With Christmas-related stuff going on over the next few days through the 26th, updates to Chocolate Book may be limited, but I’ll try to post as time permits. Enjoy the holidays, whatever you celebrate. Posted in Daily Reading, Isaiah, Old Testament.Tagged bible, christianity, God, Isaiah, listening, metaphor, omnipresence, prophecy, scripture.